Improve your quality of life with the best handicap equipment. The costs for post stroke equipment itself are usually several hundred dollars, of which most insurance pay a significant amount. But these costs do not include the fees incurred by physician’s visits, physical therapy, other specific treatments, and post stroke prescription medications. That total also does not include the costs of hospitalization if that is necessary after a second stroke. With so many costs for post strike victims, it is good to know that there is helpful and affordable equipment for people who had a stroke. Grab bars, canes, walkers and wheelchairs are all common post stroke equipment. Regaining the ability to walk properly and safely again is one of the biggest symptoms and consequences of having a stroke. With the right post stroke equipment such as sophisticated electrode ankle units, stroke victims are now able to much more effectively coordinate their gait as close back to normal as possible. Just standing up from a sitting position is often quite difficult for a post stroke victim due to uneven strength in one side of the body. Post stroke aids like handicap grab bars can be very advantageous in these new learning circumstances when the traumatized brain is trying to relearn a basic task like sitting up or utilizing both sides of the body uniformly. Grab bars can also help to reduce falls if they are placed in a home environment. There are also grab tools for patients post stroke that assist with grip problems and reaching issues. Using walking canes and handicap walkers are quite effective in benefiting post stroke victims with regaining their mobility and coordination. These pieces of helpful equipment are used to induce a multitude of repetitive movements in the lower body which in turn registers in the brain to retrain the brain to relearn how to ambulate much better and with much more balance and flexibility as well. In a home environment, parallel bars for rehab make for great strength training devices to help relearn and strengthen those lower limbs. When post stroke equipment is used in a home environment, this greatly enhances the victim’s self confidence because he feels safer and more secure in his home and he gets used to learning how to move around with much more ease while being less dependent on any assistant helping him perform his physical improvement and brain-body reconditioning tasks and actions. This boosted level of confidence definitely helps with physical improvement as well due to new neurosynapses being redeveloped in the brain. Which Medical Equipment Does Insurance Cover? Fingerless Wheelchair Gloves – Do You Need Them? Providing the Best Online Resource on Handicapped Equipment. 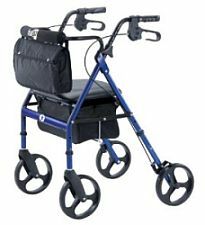 Handicapped Equipment is a participant in the Amazon Services LLC Associates Program, an affiliate advertising program designed to provide a means for us to earn fees by linking to Amazon.com and affiliated sites.